I am very passionate about spreading the word about electric bikes as useful, convenient, and fun vehicles for getting around town. I believe that electric bikes combine some of the conveniences of a car with the advantages of a bicycle. I recently came across this great video about the owner of Faraday Bikes, Adam Vollmer, and his story definitely captures what I strongly believe in. So without further ado, enjoy this video from Dark Rye! What do you think? Are you seeing more people on bikes in your community? Do you think electric bikes could help more people enjoy bike commuting? What does it weigh, this Faraday? It weighs 39 pounds without the rack. Personally, I prefer recumbents – any plans there? What is the price for this bike? Hi Tom, this bike will retail for $3,800. This bike is similar to the sayno eneloop. How much does the Faraday in the video cost, sounds the way to go, when I need to upgrade my present one. 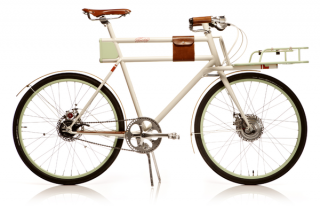 Hi Keith, the Faraday Porteur will retail for $3,800. I started a petition to legalize ebikes on Boulder, CO’s paths and bike racks because I think ebikes will in 5 years at least double the bikes on the roads, and studies prove there is safety in numbers: drivers pay attention when they see lots of cyclists. Ebikes “level the playing field” for injured, sedentary or older people -and hills! They’re great rehab. Here’s the petition: https://signon.org/sign/legalize-ebikes-on-boulder We could use some publicity. PS: The Faraday is a beautiful piece of engineering -and light enough to easily carry, unlike the majority of ebikes. BUT, isn’t it easy to burn out those hub motors -not having the advantage of the bike’s gears like with mid-mounted motors- on big hills like we have in Boulder? I love this bike, but more than four times my potential budget. I’ll stick to my Hilltopper for now. I Love our Hilltopper Hub Motor, have 2 in florida and 2 in Minnesota. when they fail I will check out all options. Cool video but Faraday is just too expensive for me. $3800 is simply too high.. I built my ebike for $1300 and it has a 1000 watt motor and a 48 volt battery.